For those of you out there who like a challenge. Jean Valjean is a man on the run. Javert is a man on a mission to find him. Les Miserables follows Valjean’s journey as an ex-convict on a quest for redemption despite his dark past. I read this book when I was in year 9 and declared it then and there as my favourite. It’s been a while since then, but the story has stuck with me and the outstanding musical is something I must see in my lifetime. It was originally written in French in the mid-eighteen hundreds and later translated into a massive, unabridged, English edition of 1400 pages plus. Abridged versions are readily available if you don’t feel quite up to that (and I wouldn’t blame you). 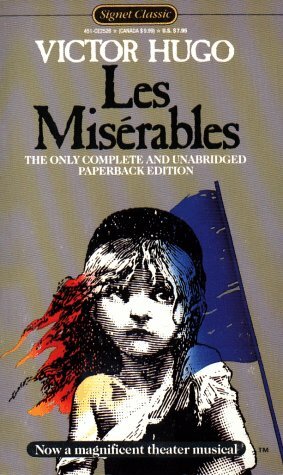 Set in 1815, the story spans a seventeen year period following the stories of Jean Valjean, Fantine, Cosette, Marius and Javert. I will not mislead you, it is by no means an easy feat, but it also an incredibly beautiful and powerful story about justice, grace, redemption, love and sacrifice against the backdrop of a tumultuous French history. Hugo also doesn’t hold back, voicing his various views on politics, religion and philosophy. I love this story. I recommend it to capable and ambitious readers who are after a bit of a challenge. It is my favourite, so I better give it 5 stars.